True Economics: 18/6/15: Tripling Permissions... and Where's That Construction Boom? 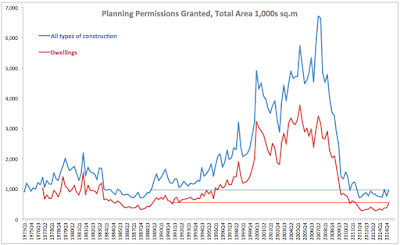 18/6/15: Tripling Permissions... and Where's That Construction Boom? Which certainly conveys a sense of a veritable boom going on in the construction sector future activity pipeline. Yes, tripling of the apartments permissions and doubling of total dwelling permissions. But here are the numbers in their more sober presentation. Please, mind - these are numbers from CSO itself. 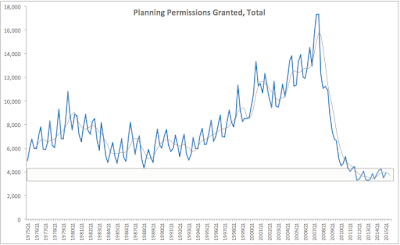 Total number of planning permissions granted in Ireland in 1Q 2015 stood at 3,895. which is 11.2% higher than in 4Q 2014, but only up 1.62% y/y. In 1Q 2014, the same rose 17.04% which is much faster than in 1Q 2015. So the boom is getting less boomier. 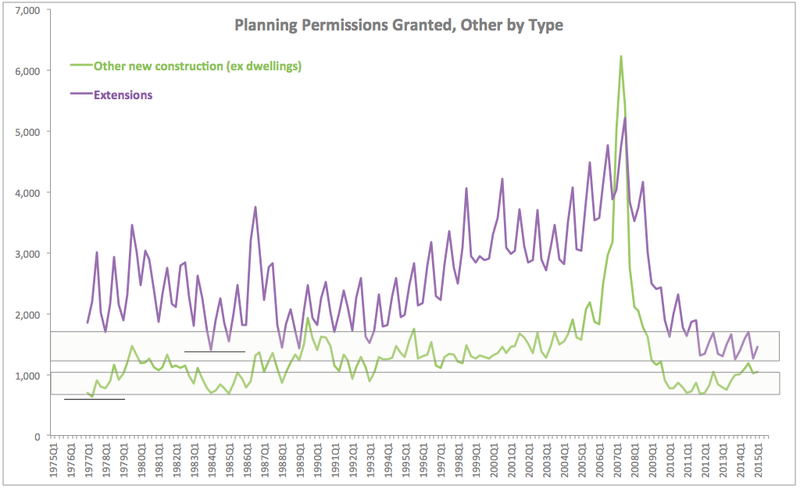 Current level of planning permissions granted is 77.5% lower than at the peak while at absolute minimum of the crisis it was 81.1% lower. In other words, we are not that far from the crisis trough. Current level of planning permissions granted is 10.27% below the absolute minimum achieved in 1975-1999 period. The record busting quarter of 1Q 2015 is actually 13.76% below the quarterly average between 1Q 2011 and today. 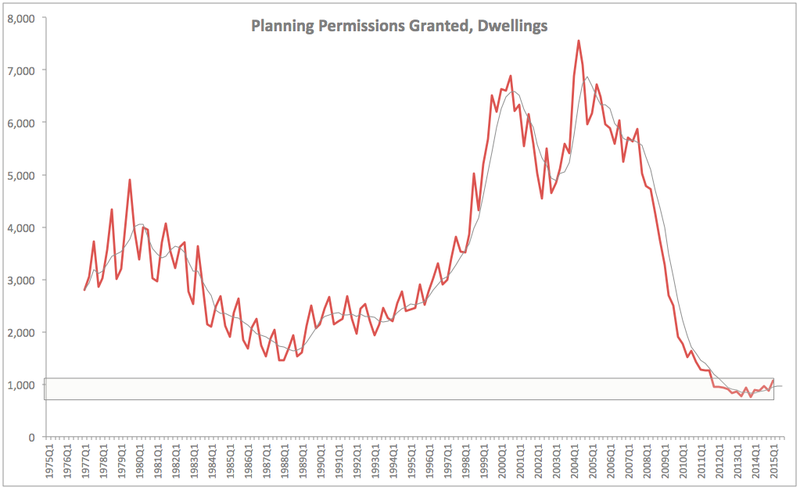 Dwellings saw planning permissions granted rise to 1,065 in 1Q 2015 which is 21.3% ahead of 4Q 2014 (remember - seasonal variation not accounted for). 1Q 2015 number is 19.5% ahead of 1Q 2014, so there is nice growth here y/y. 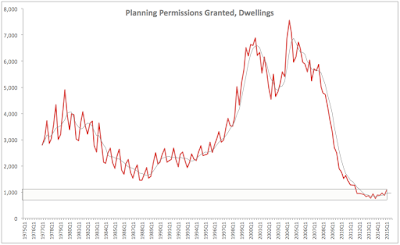 Still, 1Q 2015 reading for dwellings permissions granted was 85.9% lower than pre-crisis peak, 26.9% lower than 1975-1999 period lowest recorded number and is 35.4% lower than the quarterly average for the period from 1Q 2011 through 1Q 2015. In Sq. Footage terms: total volume of planning permissions granted in 1Q 2015 came in at 952,000 sq.m. which is 28% ahead of 1Q 2014, but 85.8% below pre-crisis peak. Things are getting healthier here, but still off very low levels. Or maybe a boom here? Ah, at last, a boom here?